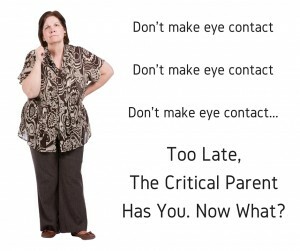 Don’t Make Eye Contact…Too Late, The Critical Parent Has Got You. What Now? Home / Don’t Make Eye Contact…Too Late, The Critical Parent Has Got You. What Now? Today I offer Part II of a special guest post from my friend Paul Sheneman. You can check out his blog here and follow him @paulsheneman. He has some excellent thoughts on something we all deal with, continually critical parents. Enjoy. Here they come again, “Don’t make eye contact, Don’t make eye contact, Don’t make eye contact… too late.” What now? The parent that you dread talking with and always comes around at the worst times. The Continually Critical Parent (CCP) is not the ones we dream of doing ministry with. But if they are a part of our youth ministry then Jesus calls us to love them and lead them in his way. Jesus had continual critics. In all 4 flavors of the Gospel, the big 3 critics of Jesus are scribes, Pharisees and Sadducees. So don’t feel like you’re alone in dealing with a CCP in youth ministry. Other youth leaders deal with it and most importantly Jesus dealt with continual critics. One poignant moment came when Jesus saw his continual critics coming from a far. He has to enter Jerusalem for the what will be the last week of his life before the cross. He knows he is going to have to face his critics. And he has three options on how to follow God’s will. He could run around the critics and slip in at night. He could attack his critics head on by calling down an army of angels. Or he could engage his critics and respond to them with truth in love (He had style going to face his critics – Read Matt 21:1-11). Run – So I’ve tried the avoiding option and it gets awkward. There is only so many times you can go to the restroom for 20 minutes each week at the same time. Seriously though, avoiding the issue doesn’t solve it. It typically makes it bigger and harder to deal with. Attack – The best defense is not a good offense in these conversations. The work is not to drive away the critics or silence them because those critics are a part of your ministry. So it might feel good in the moment to put a person in their place, but in the long run it will just hurt more than help. Engage the CCP – Here are some basics to engaging a CCP with truth in love if that is what you choose. Recognize The Source – Recognizing that you expect the person to “complain” doesn’t mean they might not have something important to say. Now perhaps something happened with their child and we need to know about. Or perhaps they’ve really observed something that can improve the ministry. Recognizing the source and choosing to listen is a choice to follow Jesus in the moment. This empowers you to love them. Separate – CCP’s criticism can be grouped into one of two types, coaching or evaluation. Coaching helps increase knowledge, skill, growth or raises feelings in the relationship. Evaluation tells you where you stand, aligns expectations, or informs decision making. (source) Identifying what type of criticism they are giving and separating it from the other helps you keep focused on the purpose of what they are telling you. Tell Me More – After the initial comments identify one thing (not 5 or 2 but 1) and ask a specific question about that thing. And tell them you want to stick to that 1 issue. By following these basic tips, you may just find that you’ll benefit from your next conversation with your CCP. What is your initial action to critical parents? Which of these tactics do you need to work on?